Postcards for Artists offers affordable, accessible, design and printing for artists, galleries, art centers, small businesses and individuals. I provide personal, one on one, friendly service, to get you what you need with comfortable, casual service and fast turnaround. 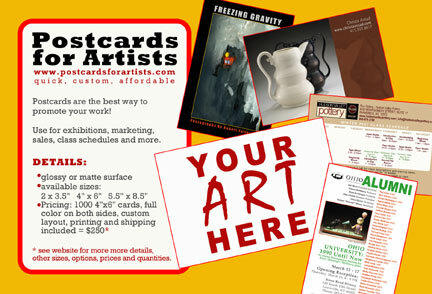 Postcards for Artists is perfect for those who want a quality, custom layout without the bother or expense of hiring a big graphic design company. 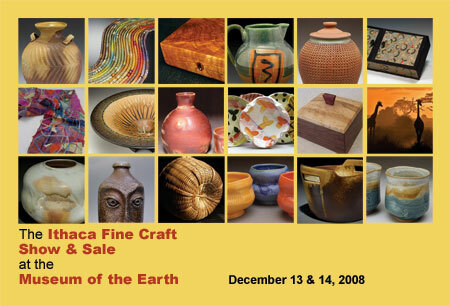 As a professional artist for many years, and a small business owner, I have a feel for what artists, galleries, art centers and other small businesses or self employed people need to promote their work and services, with the emphasis on the art, rather than a lot of bells and whistles. But, You don't have to be an artist to use my services! Postcards for Artists is perfect for other small businesses and individual projects such as wedding and baby announcements, custom holiday cards etc. We specialize is creating a custom look for your unique product. Here is a sampling of print material I've produced for clients nationwide, from artists to galleries, contractors to small businesses, including business cards, brochures, postcards and posters. Hear what clients have to say. We keep things simple. We charge one flat fee for design and layout, printing and shipping so you know what you're paying from the outset. Our highest priority is making sure you're satisfied, and we will revise as needed until you are happy with your design.